The SDIA is dedicated to supporting and promoting educational and interpretive programs which allows the public to become aware of the uniqueness of this large body of water. The Salton Sea sits 235 ft. below sea level, but is bordered by two mountain ranges. Come view this incredible contrast of geology: a large body of water in a desert valley that’s bordered by two mountain ranges, and a fertile agricultural area. 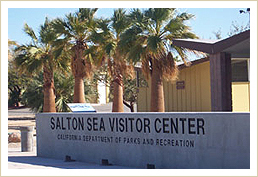 The Sea and Desert Interpretive Association (SDIA) is partnered with Salton Sea State Recreation Area and Sonny Bono Salton Sea National Wildlife Refuge Complex. Both places are located on the eastern side of the Salton Sea, along Highway 111. Founded in 1977, the Sea and Desert Interpretive Association (SDIA) is a 501 (c) 3 non-profit organization dedicated to supporting educational and interpretive activities of the Salton Sea State Recreation Area. The SDIA’s purpose is to promote a better understanding of the Salton Sea and its unique desert habitat. The Association operates a gift shop at the park’s Visitor Center, which is staffed by volunteers. Numerous informational books, DVDs, maps, pamphlets and other materials are available. A free 15 minute video program about the Salton Sea is offered to park visitors. As part of its support program, the SDIA furnishes equipment and supplies to assist park rangers and provides special funding for various community events. The SDIA provides funding for visitor and park services which cannot be funded by the state because of budgetary considerations. In cooperation with the state of California, the Association provides critical funding, volunteers and assistance in running the Salton Sea State Recreation Area. Sea and Desert Interpretive Association members enjoy a 10 percent discount on any merchandise purchased at the Visitor Center gift shop at both Salton Sea State Recreation Area and Picacho State Recreation Area. They also will receive the news letter and regular updates on the state of the Salton Sea and the restoration programs designed to save it. Inspiring the conservation of the Salton Sea and Lower Colorado River Basin. The Sea and Desert Interpretive Association promotes educational and interpretive activities to restore, preserve and protect the unique natural and historic values of the Salton Sea.